Recent statistics released by the CDC indicate that in 2010, one in three kids in the United States was obese and another third were overweight. This is actually good news, as we are starting to see a slight drop in childhood obesity rates as lawmakers, schools, community members, physicians and parents come together to encourage families to adopt healthier lifestyles. However, there is still work to do to fight the obesity epidemic. According to a study by the Trust for America’s Health and the Robert Wood Johnson Foundation, if sustained action is not taken, about 42% of the American population will be obese by 2030, continuing to increase healthcare costs and affecting the economic stability of the United States. Parents need to ask these three questions when planning meals for their children. Am I providing QUALITY food choices? Parents can reduce their child’s intake of sugar, salt and chemical additives in our food supply by creating homemade meals, made from scratch with natural ingredients. Am I providing the right QUANTITY of food? Parents should only allow four meals per day, consisting of quality food for breakfast, lunch, one afternoon snack for children, and dinner. Is it TIME to eat? Children should eat only 4 times a day, with meals 3-4 hours a part. Allowing for only one afternoon snack and eliminating all other snacking in between meals. A disturbing 1.5 million Texas children between the ages of 10 and 17 years are obese, which means 20% of the children in Texas are more likely to develop obesity related diseases such as diabetes, Attention Deficit Hyperactivity Disorder, Asthma, and have have a higher incidence of learning disabilities, according to a recent study published by the UCLA Center for Healthier Children, Families and Communities. Since obese and overweight children are more likely to stay overweight as adults and suffer from diabetes, heart disease, cancer and other weight-related conditions, it’s up to parents to teach children how to make healthy food choices. 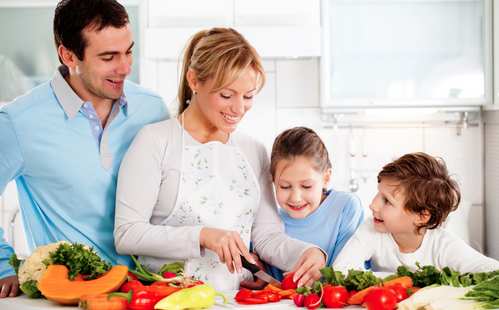 Cooking at home is fun and allows the participation of the whole family. In my book, The Step Up Diet …. From Scratch provides practical advice, recipes and even a grocery list to help you learn to cook reasonable size meals from fresh ingredients.